LOWELL, MI — If you ask Dave Cornell about long-distance hiking, the 73-year-old Delton resident is unequivocal about its place in life. “Hiking has made a difference. It saved my life. There is nothing like strapping on a backpack and climbing up a mountain to see your place in life. “I was a lawyer in my first life. 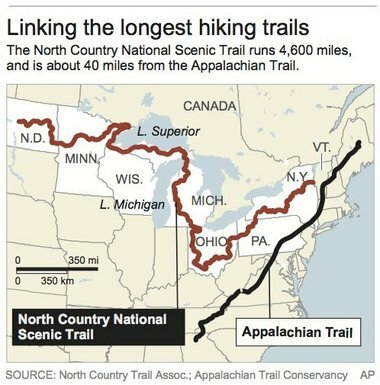 I am a hiker in my second life,” said Cornell, an at-large director for the North Country Trail Association and past president of its national board of directors. Cornell retired from law in 1993. He then took four summers to hike the 2,184-mile Appalachian Trail, an experience, he said, like no other. He will be one of 200 long-distance hiking enthusiasts from seven states that will converge on the southern Michigan town of Augusta on Aug. 1-5 when the North Country Trail Association holds its national conference. 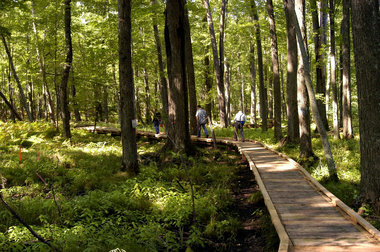 The North Country National Scenic Trail is a 4,600-mile footpath under construction. It will run from North Dakota to New York when it is complete. The trail is part of America’s National Trail System and was approved by Congress in 1980. The North Country Trail is nearly 60 percent complete. There are 2,701.6 miles on the ground. In Michigan, the midway point, 754.1 of 1,150 miles are complete. The five-day conference will be a blitz of hikes, music, trail talks and workshops geared to bring the latest trail protection news and building techniques to NCTA members, the volunteers from local chapters who have constructed much of what is on the ground. The trail will be getting a boost from recent developments, Cornell said. Mark Weaver has been chosen as the new National Park Service superintendent. He will be living in Lowell where NCTA has its national headquarters. Weaver’s appointment as a full-time NCT superintendent is expected to help improve its funding and development. The conference and its workshops are open to the public. Registration can be accomplished online by going to the North Country Trail Association website and clicking on the conference link. There are conference workshops on trail building, construction, sustainable trails, route planning, trail towns, land navigation, trail protection and back-country medicine, to name a few. The trail is entering a new era, according to Matthews. Congress approved giving the trail “willing buyer, willing seller authority” in 2009. That authority allows for the acquisition of lands or easements along the trail, should money become available. “The miles on the ground, so far, have been the easy part,” said Jeff McCusker, the park service trail manager in Lowell, who was hired for the position in 2011. He and Weaver will be at the NCTA conference. Easy, he said, because most of those miles were built on public lands. The tough part is getting across the private lands that are left. Cornell said he is confident that progress will be made. “Next year, we will have grants totaling $15,000 to $30,000,” Cornell said. “It is small money, but we hope it will snowball. Matthews agreed, pointing out Pennsylvania easement projects, as well. Hikers attending the NCTA conference will have 10 hiking locations from which to choose. Matthews said it is a good time to get out and see different parts of the North Country Trail. This story and more can be found at MLive Outdoors. This entry was posted in Uncategorized and tagged Environment, Hiking, National Park Service, National Parks, National Scenic Trails, National Trail System, North Country Trail, North Country Trail Association, Trails. Bookmark the permalink. This is great news! Having the National Forest people close at hand will help the Trail out immensely. The Trail will never get much from the Michigan DNR. Their focus is on Bike Pathways, and they do not care much for real Trails. Please keep up the great work!!!!!!!! !